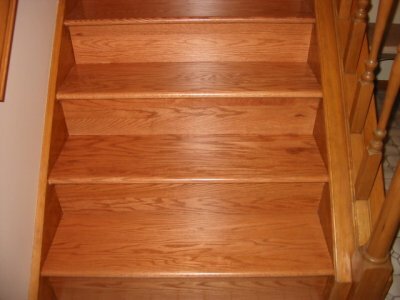 Why Choose Stair-Treads.com For Your Prefinished Hard Wood Stairs Needs? Many home improvement stores carry the supplies needed to replace or upgrade to hard wood stairs. However, this requires time spent traveling to and from the store, hoping you have purchased the correct size and color, and wasting unnecessary time and money in the process. Convenience – We offer several different types of prefinished stair treads, risers and handrails to match any décor or budget. From traditional stair treads and risers to completely replace existing carpet or hard wood stairs, to retro replacement treads and risers that can be installed over existing carpet stairs for a quick and easy upgrade. Choice – With over 25 species of wood available, we are sure to have what you need. Our selection ranges from basic oak and trendy, eco-friendly bamboo to exotics like tigerwood and African mahogany and anything in between. Customization – All our hard wood stairs, risers and handrails can be custom-stained to match the wood already in a home or to meet other specifications. We generally get over 90% approval by customers on the first attempt. All you need to do is send us a sample of the wood you would like us to match, and we will save you the trouble of hunting down similar stains on your own. We operate out of a 6,600 square foot finishing facility in Charleston, South Carolina right next door to our 60,000 sqft main production facility with branch offices in North Atlanta, Georgia and ship our hard wood stairs country wide from Pennsylvania and Maryland, all the way to Texas, California, Washington and beyond. Since we operate solely online and don’t have a retail storefront, we can pass our savings directly to you. If you have any questions about our hard wood stairs, our custom staining process, or how we can save you time and money on your project, please contact us today and we will be happy to help you.